Now offering FREE High-Speed Internet Access in ALL rooms. When you stay in Phoenix, it's all about location. 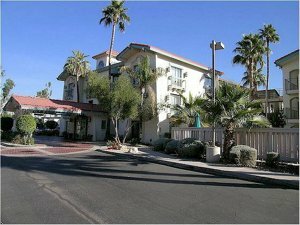 The La Quinta Inn Phoenix Sky Harbor South is just two miles from the airport. We are three miles from downtown Tempe, home of Arizona State University (ASU), and the Arizona Cardinals. Have fun at the Arizona Mills Mall, acres of manufacturer and retail outlet stores, popular themed restaurants, IMAX and more. Take East exits 153/143 Hohokam Expressway South to University. Turn Left on University, proceed under Highway 143. Turn Right on 48th Street. The hotel is located on the left behind Denny's. From I-10 East: TAKE LOOP 202 TO HWY 143/HOHOKAM EXPWY SOUTH. LEFT ON EXIT #2/UNIVERSITY. RIGHT ON 48TH ST.
From I-10 West: EXIT HWY 143/HOHOKAM EXPWY AND SKY HARBOR AP. EXIT TO UNIVERSITY. RIGHT ON 48TH ST.
Sandwiches, wraps and salads. They make homemade breads and bread bowls.